Woven and separate as lights of the north. Existences lived in an uncommon realm. Carefully passed through the ages of time. Rose through our voices and guided my dance. 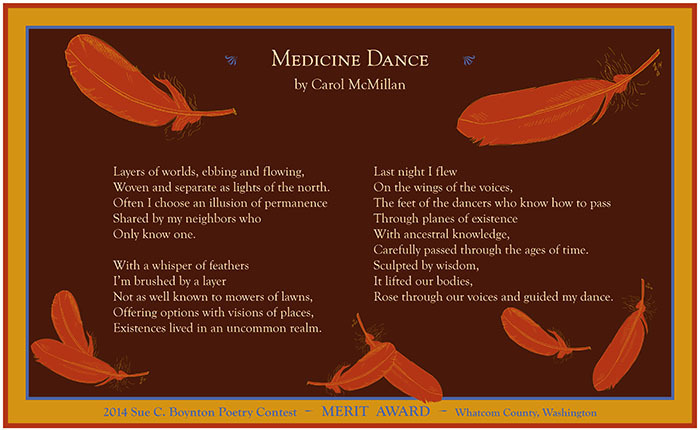 *Copyright 2014 by Carol McMillan. Broadside designed by Anita K. Boyle, Egress Studio. Illustration by Angela Boyle, Flying Dodo Publications. You are invited to an online poetry open mic on spreecast. URIRL (u r u in real life) presents selected and featured readers plus open mic today, Saturday, June 28, 2014, at 1 o’clock Pacific time, 2 o’clock Mountain, 3 o’clock Central, 4 o’clock Eastern. All you need is an internet connection and a free spreecast account (and a webcam if you want to read). In Bellingham, Washington, you can also tune in by joining Thom Davis for Open Laptop at the Alternative Library. See the event page on Facebook and see more on the URIRL Tumblr archive. Nearly a year ago, we posted about the Literary Clock, an ambitious undertaking of The Guardian (UK). Launched in 2011, the project is still attempting to find a literary quote (including poetry, of course) that cites a particular hour and minute for every one of the 1,440 minutes in the 24-hour day. The clock, which is live online, provides the relevant quote at the exact minute it cites (to see a new quote, wait for the second hand to sweep the new minute). Starting at about 9:00 a.m., there are quotes for nearly every minute, but in those early-morning hours between midnight and 9 there are still many quoteless minutes. Have a look at The Guardian’s updated chart of missing minutes and keep an eye on the clock as you dive into your summer reading. If the American Academy of Pediatrics has anything to do with it, you’ll be reading more — and that includes reading more poetry, right? — to the infants in your life. Which poems would you recommend for the youngest audience? Read the article by Motoko Rich in The New York Times. In case you missed it, James B. Stewart’s June 20 article in The New York Times, “Booksellers Score Some Points in Amazon’s Spat With Hachette” (also published June 21 in the The Seattle Times as “Seattle bookseller uses Amazon spat to connect with his customers”) puts one of Seattle’s stalwart independents, Third Place Books, front and center in the developing story of the “spat” between Amazon and Hachette.